He strolls into the Dandora Stadium every single morning at 8am. His is a story of the struggle of a life he never crept himself into. A victim of circumstances you would say but he is definitely determined to get himself off the hook of a desperate life. He jokes, grins and giggles with his team mates as he changes into his training gear. Looking at him at a first instant, you would not draw the image of a reformed petty criminal and a boy who gets his livelihood from a place everyone considers a waste disposal site for their un-usables. Meet the bubbly Zachariah Njoroge Kamindo, a young man determined to get the best out of a hard life and who casts so much brightness into his future, you can be blinded by the sight of it. 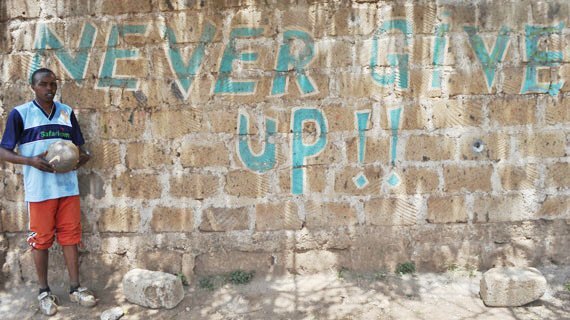 Born in the sprawling Mathare slums, Njoroge struggled through school. He however completed Class 8 but in a hard way. His mother was jobless often fending for him and his six other siblings through small jobs while his father drowned himself into illicit brew. They never really depended on him because the most he could do was sleep when he was not in his favorite chang’aa den. They moved to Dandora after a short while with his mother and siblings, leaving their wayward father behind. “As a kid, life was hard. Sometimes we would go without food when our mother failed to get a job. We struggled with school and with all the difficulty surrounding our lives, none of us managed past primary education. It was a tough life in the ghetto. Sometimes it forced us to fend off for ourselves. My first born brother who was expected to be like the father figure in our lives couldn’t do much. He was also drowned into pints of alcohol and he became as unproductive as our father. It was now up to me to hustle with my mum for our daily bread,” Njoroge says in an interview with michezoafrika.com. After seeing that life was not going to get any better depending on his mother, Njoroge took the bold step of a man. He decided to leave his home and start his own life. Since he did not have any meaningful qualification to be employed, he decided to look for the best option that could rake him a living, even if for just a meal a day.There, he would fend off for himself and provide too for his mother. “I searched around and looked for something I could do to keep myself alive. With a poor Class eight certificate, there was no way I was getting a job. Most of the boys around worked in the Dumpsite and I had heard so many good stories of how one can make a good living from the dirty. I decided to venture in. That was ten years ago,” Njoroge says. As he continued, he slowly started engaging in petty crimes around the area mostly because of the company he was in. “I was a little bit of a coward so I did not want to engage in big crimes. I had seen most of my friends dying because of mob justice and being shot down by police. I only did the small crimes which would not get me into so much trouble. I would do this whenever there was nothing new in the dumpsite and I had nothing else to do,” Njoroge admits. This would be his normal way of life until a day he passed near the Dandora Stadium and saw a group of boys he frequently worked with in the dumpsite enjoying a kick of a leather ball. “We were just passing through with my friends and we saw our colleagues playing soccer and we got interested. We asked Coach “Jush” (Antony Ogwayo) whether we could join in and he gladly accepted. He welcomed us very well and helped us with basic soccer skills and talked to us after training of how we should keep our lives well and avoid bad deeds,” Njoroge notes. That was the turnaround of his wayward and aimless life. Being in the soccer team drew his mind away from the bad company and he started having direction in life. “I started using my freetime for soccer. I come to the pitch early in the morning, train up to eleven, go to the house and change into my work attire and head to the dumpsite. After coming from the dumpsite in the evenings, I am usually very tired and drown into sleep. This has kept my mind positive and listening to the words of Coach Jush, I always have hope for the next day,” he says. But life in the dumpsite is one he would most likely want to leave behind, looking at all the consequences of the struggles. “Right now, I am being treated for Amoeba at Kenyatta. We eat food from the dumpsite and sometimes we get good food and sometimes bad food. My hands have countless cuts and bruises because we use our bear hands to wade through the waste. Sometimes you do not even know what cut you but because you have to struggle with life, you can never give up,” he says. Zack, as his team mates call him would love to take his love for soccer higher and wants to use it to pick himself out of the Dumpsite life. “I want to take soccer as my way of life. I have come to love soccer so much and I want to improve myself and possibly one day, play for my dream team Thika United. We have participated in various tournaments and street soccer competitions and this has given me the urge to work harder in soccer,” he adds. And to those in similar circumstances with the hard nature of life having trodden on their heads, Zack has simple advice for them. “WORK HARD AND NEVER GIVE UP. If you have a talent, do not lose hope on it even when it feels like you are going nowhere. Work hard on it and keep good company. If you surround yourself with people of a good mindset, your life will definitely head in the right direction. Trust in God and have faith in your abilities,” he concludes.